The news is sensational, according the French magazine L'Express the offices of France's former president Sarkozy were victim of a cyber attack, but what is even more remarkable is that for the offensive was used the famous malware Flame. On the origin of the malware still persist a mystery, many security experts attribute it to joint work of Israel and US development team. Let's remind that according the analysis on Flame source code conducted by Kaspersky the malware is linked to Stuxnet, a version of the famous virus shared a module with the spy toolkit. Frame is considered one of the most complex spy tool produced by a state sponsored project and its use in the attacks against French government suggests the existence of a cyber espionage campaign to collect sensible information. "Hackers have not only managed to get to the heart of French political power," "but they were able to search the computers of close advisers of Nicolas Sarkozy." Surely the operation has led to the theft of confidential information regarding the policy of the French government even if it seems not to have directly involved the President who does not have a personal computer. "secret notes were recovered from hard drives, and also strategic plans." reports the article. 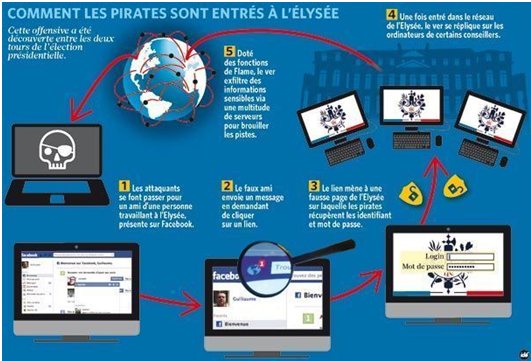 The vector used to spread the malware is the popular social network Facebook , the hackers shared a link to compromised website that replicated the Elysee's intranet site gathering also user's credentials. Flame has infected the pc belonging presidential network which include of a number of Sarkozy's closest collaborators. The malicious code has been detected by the Agency nationale de la sécurité des systèmes d'information (Anssi) that immediately has knocked out the network to conduct the proper analysis and of course the sanitation of the IT infrastructure. The French government avoided to comment the incident, but in internet is circulating the news on a possible involvement in the operation of the United States. Fonts of the government revealed that the national infrastructures are steadily under attack, they declared that other two large scale cyber attacks were discovered in May without providing further info.